As far as I know, the First to Fight kit, released in 2014, is the first plastic model of an early PzKpfw II Ausf C, with the rounded hull's front without extra armour. (Ed.note. : In fact, Attack has this version in their range as well.) Practically identical were earlier models: Ausf c (small letter), A and B, constituting a family of so-called 'standard' PzKfw II tanks. Only after hard lessons from the Polish campaign, PzKpfw II were fitted with extra armour on the nose, giving it an angular look. 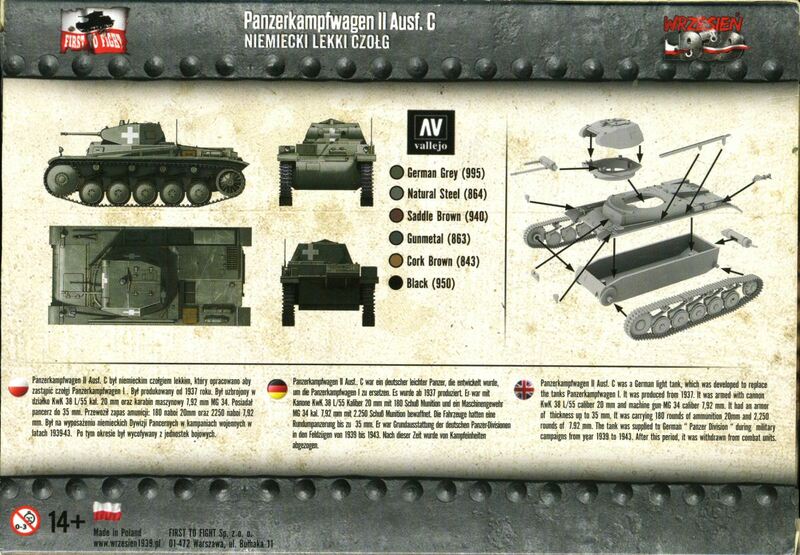 Therefore, the model represents the most typical German tank from the 1939 Polish campaign. Such tanks also still constituted some 30% of the PzKpfw II fleet during the French campaign. The model is a quick build kit, similar in appearance, design and detail level to the late PzKpfw II C manufactured by S-Model. In fact, the similarity of the moulding quality of these two kits is striking. Both have tools finely moulded on the fenders, which also have a delicate pattern. All the parts are very sharp and highly detailed for a quick build kit. Separate parts are: a jack, headlights, an antenna trough, and, contrary to S-Model, a driver's visor. On my sample there were no sinkholes or flash. All the ejector marks were on the inside of the parts and not in visible places. Overall the moulding quality is very good and details are delicate. Unlike in S-Model's kit, there are no brass barrels nor PE mesh for the muffler's cover, but the existing plastic barrel is adequate in my opinion. As for the muffler's cover, it has a fine mesh pattern, but unfortunately, not in the upper part, where it should also be. Also, unlike S-Model's kit, a two-part turret hatch is molded closed, and there are no details on the tank's bottom. The gun and machine gun are molded as one part with their mantlet, and they can elevate, although it needed some plasticine to make it tight. Height: 1990 mm / calculated 27.5 mm / model 26.5 mm. Since this is a quick build kit, the main area of simplification is the suspension, which is all cast in one piece along with the tracks, for each side. They look almost identical, as in S-Model's kit. They can be attached to the hull without glue, and also the lower and upper part of the hull can be assembled without a glue. A vice of such technology is that the exterior surface of the tracks is rendered in simplified way, limited to transversal bars, although the designers spared an effort to imitate protruding drive sprocket teeth. On the other hand, the sides of the tracks have very nice details, including hollow sides of the guide teeth. Of course, with such technology, the two rows of guide teeth have been replaced with one thick row, but this is hardly visible and by no means striking. All wheels have a generally correct shape and look, save the fact, that in the idler wheels the eight spokes are a bit too short and do not connect with the hub, as they should (I can see the same in S-Model's kit). It is however disappointing, that rocker arms and springs have been flattened and partly interfere with the wheels (the same can be seen on S-Model's kit - possibly the technology did not allow to place rocker arms and springs deeper?). For a quick build, this kit is of high quality and moulded to a high standard. Recommended for wargamers due to its simplicity and low cost, but also for modelers, due to the high level of details and overall quality. 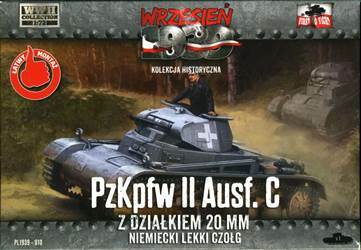 While simplified tracks and suspension make it inappropriate in the role of a showcase model, it is a great addition to a Polish campaign diorama.